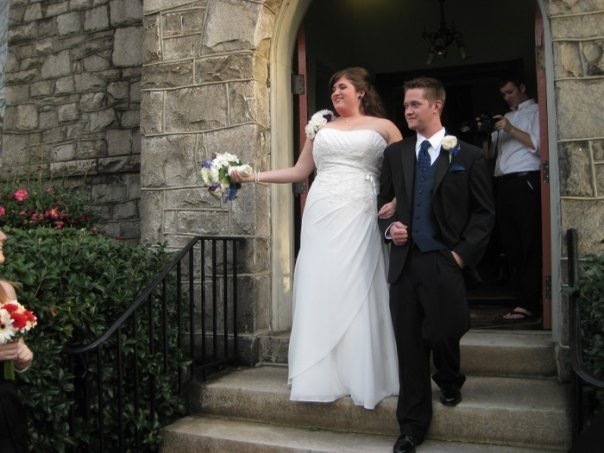 Tomorrow, November 14th, makes 7 years since Rob and I celebrated our wedding day in 2009. And for those of you “in the know”, you may remember we officially married that summer, just the two of us, in the Huntsville probate office. We don’t even have a picture from that day because that was before we had iphones, and it didn’t really occur to us to even take one! It was just a beautiful Monday morning that will always be a special day remembered. 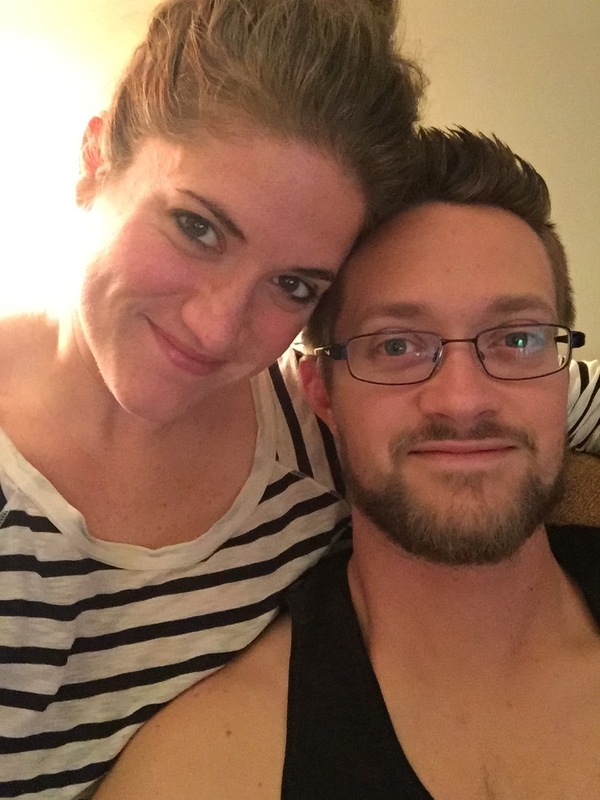 So this year, in honor of the man I married twice, I wanted to celebrate with 7 memories from the archives, even though our memories really span so much more than that. With over 11 years together, it was really hard to select only seven, but hopefully you’ll enjoy some never before seen or shared memories. They say a picture is worth a thousand words, so what are seven worth? September 19th, 2006 – When I think back on college at Auburn, the fire that burns brightest for me was Aspeed. Aspeed was our car group that met every Tuesday at 9pm. It started at the Intramural fields, but in 2006 when the new parking deck near the stadium was completed, it relocated to the upper deck. It was empty, well lit, and a perfect meeting place for our shenanigans. I have unbelievably vivid memories of night drives from our apartments, meeting up for dinner with friends and then spending the last hours of the day hanging out, talking cars and college and everything in between. 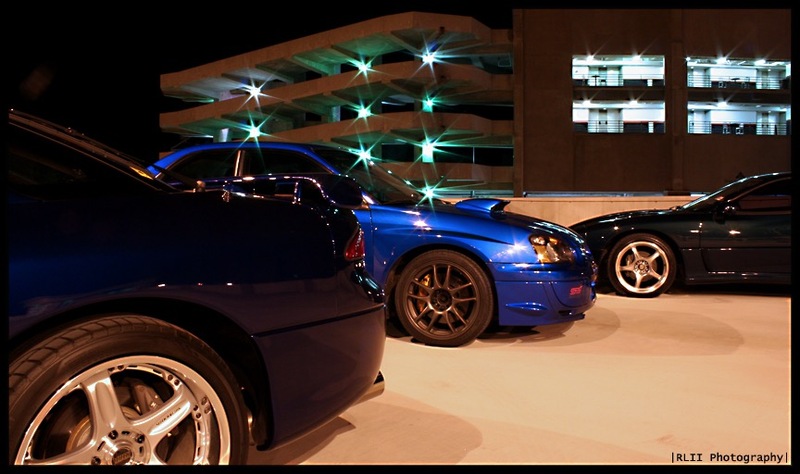 The below picture was a shot Rob put together of his blue VR-4, our buddies STi, and my green VR-4. They say you can’t go back, and you really can’t. Aspeed disbanded a few years after we graduated and now you couldn’t access the top deck without a pass, but I will always get sentimental when I think of the friends we had, the cars we drove, and the time we spent together there. 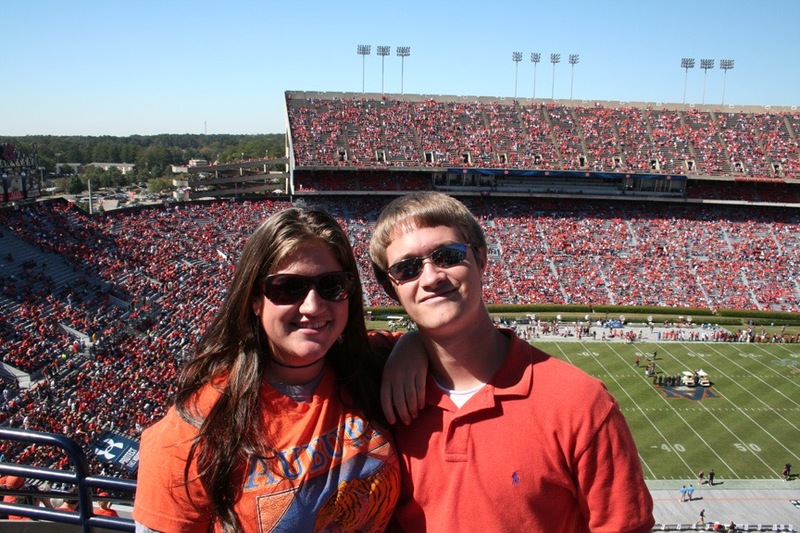 October 21st, 2006- my very first AU home game as a student. This was our junior year of college and I had only just moved to Alabama a few months prior. I knew SEC game days were a big deal, but had never really experienced a college football game quite like this. Rob’s family had had the same seats in the upper deck for over a decade, so it felt like I was immediately apart of a long standing tradition, not only at Auburn, but in this awesome new family I was getting to know. Rob, what is going on with your haircut? 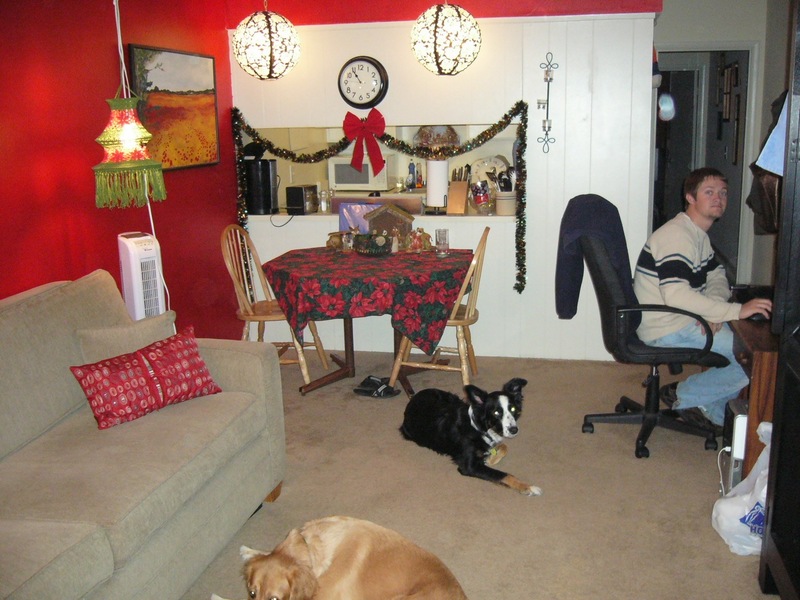 December 18th, 2007 – This was my very first apartment where I didn’t have a roommate, and I was able to do whatever I wanted, including have a 70 pound dog. Don’t you love what I did with the place? Believe it or not, I was not aiming for the world’s tackiest Christmas, but was given a bunch of hand me downs from my Mom that I had to make work. In between my full time school schedule and working about 20 hours a week making 7 bucks an hour so I could feed myself and take care of Sam, this is what young love during the Holidays looked like. Rob and Jackson spent a lot of time hanging out over here since it was free from roommates and we spent many fun days and nights here cooking, walking the dogs, and studying. I remember when I moved in I was dead set on painting the walls red, so Rob helped me. I think about the girl I met next door, who would go on to become one of my dearest friends to this day. I remember that couch and how we bought it from someone off craigslist or something and it was the longest most difficult thing to move (you had to unscrew the legs to fit it through the doorframe). I remember when Sam decided to chew several holes in that pillow. And believe it or not, I still have that poinsettia table cloth, and every year I still take it out of the decorations box, look at it, and then think “One day I will find the perfect use for this hideous thing”. April 5th, 2010- Rob will likely hate that I chose this picture because it was during our fat years, but it actually represents some big steps for us. First, that’s our first house! WE bought it. We worked hard and had parents that supported us and believed in us along the way, but that house represents our hard work, our patience and our money. We had just moved in earlier that year and on this night, we had made another “big purchase”. 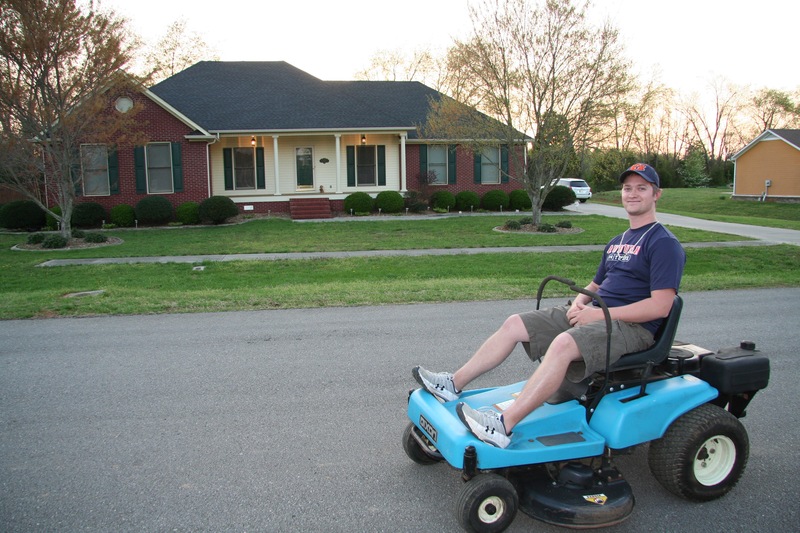 Rob bought his first zero turn radius riding lawn mower. He did a lot of research, like he always does, and found a guy local that sold older models that had been “fixed up”. I remember him telling me it was going to cost 1,000 dollars and my heart sank. That was like, our whole life’s savings!! But I trusted him. I knew he never lets the sun set on a day where he doesn’t have our best interest’s in mind, and I knew that it would make his life easier when it came time to take care of our lawn which sat on nearly an acre. So I said yes, and we brought home the ol’ Dixon. Rob was SO proud, and he and that Dixon enjoyed 4 glorious summers together before it finally gave up the goat. December 11th, 2011- This pictures makes me laugh when I look at it today, but on this particular night, I cried. I would show you the beautiful before picture, but that would put me over my “seven picture limit” so I’ll just let you imagine it. 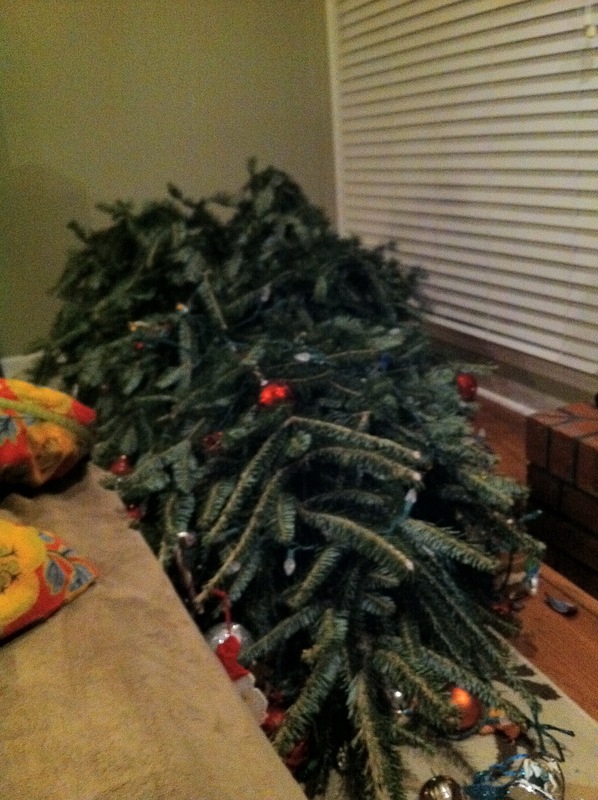 In the days leading up to this, I kept mentioning to Rob I thought the tree was leaning a little forward and with the ornaments, I was worried it would topple over. He assured me it was sturdy in place. To make matters worse, on this night we had taken our guest bedroom mattress and drug it into the living room to sleep by the fire (we did this often during the cold months since we burn a fire in our living room almost every night). So there we were, laying on our floor bed enjoying our fire, and here comes the tree. Total chaos and destruction, and in typical woman fashion I screamed “See! I TOLD YOU! !” and then immediately began to cry. I did take this picture and I’m so thankful that in that moment, I knew I would want to look back on this one day and laugh. And so I do. October 6th, 2012- I could have chosen from a hundred or more pictures just like it, because we’ve logged some miles together at car shows. 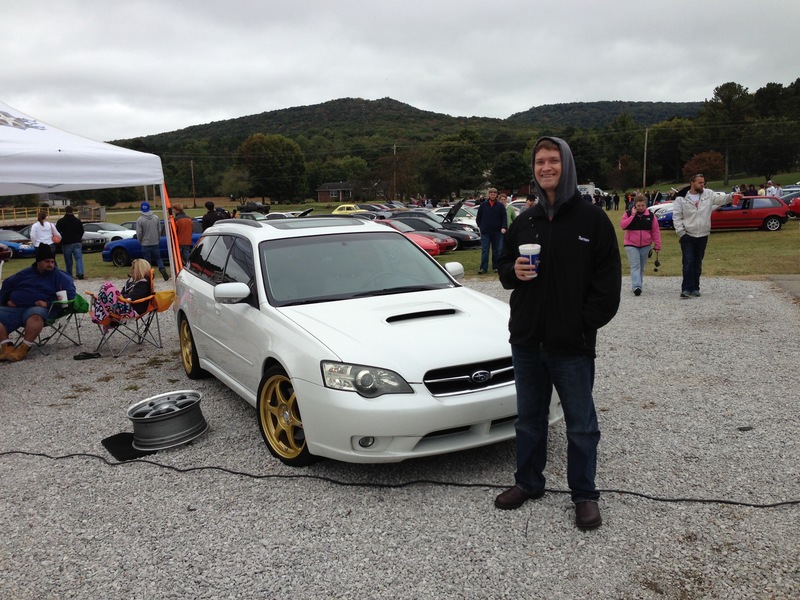 This one was a big meet near our house, and Rob’s old legacy wagon was featured at a vendor’s booth for the wheels they had redone for him. It was a cold, dreary day, but that didn’t stop us from getting up early and showing out. When I see this picture, I think of how my husband will always be a car nut. I think about all of the time he spends pursuing his passion and how hard he works at his job to make it all possible. I think of how much he loves coffee, and that there is a 50/50 chance that any picture I take of him, he’ll either be holding a beer, or a coffee. We were fortunate enough to sell this car to a couple from Montgomery, who then became some of our closest friends. I think of them too when I see Leggy. And last but not least, January 5th, 2016. This picture is nothing special, it’s just he and I one night before bed. I love it when he takes his eyes out and wears his glasses, and I love that he’s so incredibly handsome without even trying. This is my human. This is us, the way I think of us. In our home, probably drinking beer (or coffee) and growing a friendship that we’ve been working on for 11 years now. What are seven pictures worth to me? More than life. They are priceless memories whose seeds have bloomed lush and beautiful behind me as I look back over my shoulder over this field we’ve walked through together. Happy 7 years Bear.